If you see this cute, golden acorn-type squash, buy it! It’s called Gill’s Golden Pippin and is incredibly flavorful–much more so than most acorn types. The skin is very hard and brittle so I just crack it in half and scoop out seeds and roast. And it’s fun to serve, in it’s little boat-like shell. You can enjoy them as is or serve them filled with anything from been or beef chili to cooked grains or even other cooked vegetables. Cut squash in half, lengthwise and scoop out seeds and strings. Rub each cavity with a little olive oil, sprinkle with salt and then put in whatever herb you’re using. 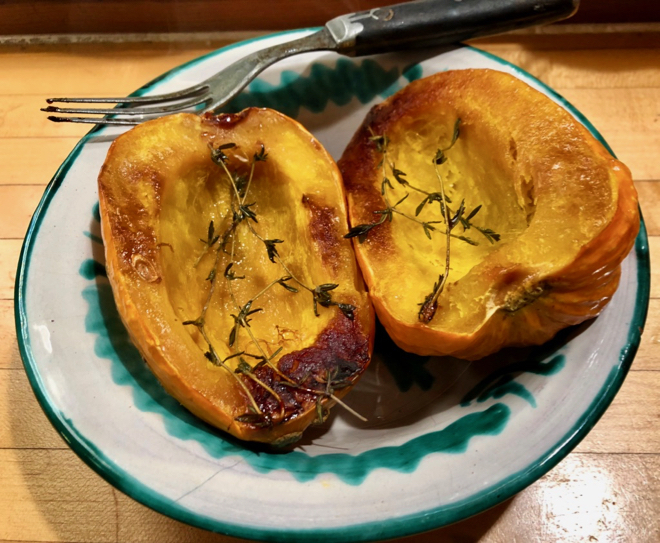 Place the squash halves cut side down on a baking sheet and bake until tender when pierced with a knife–about 25-40 minutes, depending on your squash. Enjoy hot or warm.